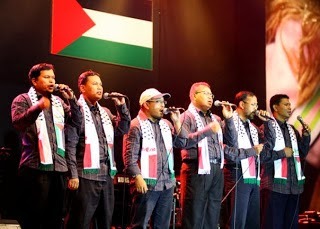 PALESTIN DI HATI KU: The GMJ, the 36th Land Day and IMAGINE Revolution! 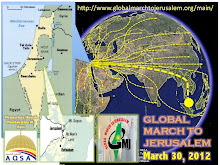 The GMJ, the 36th Land Day and IMAGINE Revolution! As “reality leaves much to the imagination” [John Lennon] I imagine the third intifada could finally erupt if those two events were joined into from every city, town and village throughout Israel by contingents of nonviolent residents who would pitch tents in nonviolent solidarity as global citizens of conscience amass on the borders of Egypt, Lebanon, Jordan and Syria and all upholdThe document of Principles “The Freedom Call” which ascertains the significance of Jerusalem politically, culturally and religiously to all Palestinian people and the global community. The Global March to Jerusalem’s Declaration of Principles underscores that the GMJ does not represent any one faction or political party but calls for participation from all social forces, political factions and ideologies to respond to the call for justice united in a peaceful movement that steadfastly refutes the use of violence to achieve goals. The eyes of the world will view Israel’s response but when the eyes of the leaders of the world see the right of the Palestinian People to liberate their land and live in freedom and dignity; the holy city of Jerusalem could be a City of Peace and the Holy Land could be whole indeed. But, for that imagination to even approach reality we must know, honor and learn from history. “Our plan is to organize massive marches towards Jerusalem, or to the nearest point possible according to the circumstances of each country, in Palestine (the 1948 seizures, the West Bank and the Gaza Strip) and the four neighbouring countries: Jordan, Egypt, Syria and Lebanon…In addition, mass protests will be organized in front of Israeli embassies in the capitals of different countries, or in the main public squares in the big cities of the world. On Land Day in 2006, just after the break of dawn, a group of Israeli Jews and I traveled three hours north of west Jerusalem to the lower Galilee municipality of Sakhnin, an Arab village whose land continues to be grabbed and colonized by settlers. Ronnie turned serious and continued, “Religion is used as a cover, but it’s all about the land! It’s convenient to claim one is doing something for God but the laws are made to take the land. We don’t have settlers in Israel -the common name for illegal colonists in the West Bank-we just take it! First it is claimed to be for military reasons then it’ll become a park or agricultural land that the state has confiscated. Over 100 Israeli’s, Arab Christians, Muslims, atheists, communists and internationals attended a tour of Sakhnin and conference coordinated by Batshalom and The Women’s Coalition for Peace and Justice. I learned that not only had Israel confiscated acres of the most fertile of Palestinian land they had also placed land mines all over the land. Many farmers and other innocent ones lost their lives or legs, so people quit caring for their groves and the Israeli government declared the village of Sakhnin a military zone. A few years prior, the President of Israel had declared that the people of Sakhnin, deserved to have their land back. But the Israeli county of Misgav, abetted by the Israeli Land Authority continued to collect taxes from the indigenous people but not return any land or issue permits for Palestinians to build upon their legally owned property. The speakers spoke in Arabic or Hebrew, and my interpreter was Aliyah [Hebrew for "Go Up"], who was born in St. Louis, grew up in Cleveland and moved to Israel in 1948. She told me, “My Father was born in Jerusalem and I was a Zionist, but now I am not so sure. I still want the Jewish people to have a state but it must be honest and moral, I don’t want a piranha state! Before 1967 I was euphoric! My husband and I began to learn that there were Israelis who you could call prophets, who said we must return the land and make peace. Then a fundamentalist Jewish group, The Gush Emunim began erecting the settlements in the newly possessed land. In the Northern part of Israel 53% of the population are Jews who control 80% of the land. 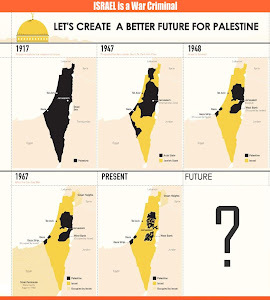 Palestinians are 47% of the population with only 20% of the land. 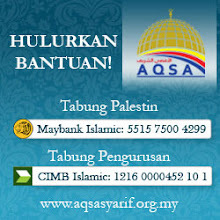 Sakhnin’s 25,000 people are allowed to access less than 10,000 dunums of their land but they only control half of that. In 1948 they owned and controlled 170,000 dunums. A Defense Industry and Army base complex a few miles from where we stood was also home to a mysterious warehouse. Aliyah remarked, “No one knows what is going on inside, but it may be a nuclear reactor. The municipality asked the army to develop in another direction for there is a school over there too. The Israelis are allowed to expand anywhere, but the people of Sakhnin are not allowed permits to builds on their own land. Since 1967 Israel has confiscated more than 750,000 acres of land from the 1.5 million acres that comprise the West Bank and Gaza. Most of the land has been confiscated to make space for settlement expansion and bypass roads that are for the exclusive use of Israeli only colonists. Since 1948, Israel has confiscated nearly 85 percent of the territory within the Green Line from Palestinians. Most of this land was taken from the 750,000 Palestinian’s who were made refugees when they were evicted or fled in fear during the 1948 war. The Israeli Knesset has passed dozens of laws in defiance of U.N. Resolutions and International Law, such as The Absentee Property law and the Development Authority (Transfer of Property) Law. That law in Arabic is called ‘Qanoon Elhader/Gayeb’, and was adopted in March 1950. It classifies anyone who was a citizen or resident of one of the Arab states or a Palestinian citizen on November 29, 1947, but had left his place of residence-even to take refuge within Palestine- as an ‘absentee’. Absentee property was vested in the Custodian of Absentee Property who then ‘sold’ it to the Development Authority. This effectively authorized the theft of the property of a million Arabs, seized by Israel in 1948. Adopted in July 1950, this law was devised as a legal ploy to shield the Israeli government from the accusation that it had confiscated abandoned property. The Development Authority is an independent body empowered to sell, buy, lease, exchange, repair, build, develop and cultivate Palestinian property and none of these transactions can take place without a Jew or a Jewish entity! 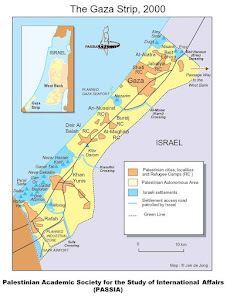 United Nations Security Council Resolution 242 clearly asserts that the “occupying power cannot move segments of its own population to parts of the land it occupies,” or make any demographic or territorial changes that are not in the interest of the occupied. Furthermore, provisions of the Fourth Geneva Convention have unquestionably condemned Israel’s settlement activities and demanded the ceasing of “all” settlement expansion by Israel. In 1990, UN Security Council Resolution 681 confirmed that the Forth Geneva Convention is applicable to the Occupied Territories and thus Israel’s compliance is mandatory. In 2005, the Israeli separation wall was deemed illegal by the International Court of Justice and described in a UN report as a “creeping annexation” with confiscation of the most fertile of Palestinian land and water sources. Israel has effectively “wiped Palestine off the map” by ethnically cleansing the indigenous population from over 500 villages. Israel calls ‘independence’ what Palestinians call Nakba, which translates to catastrophe, and it created over 700,000 refugees in 1948 who are still denied the right to return to their homeland. The Nakba continues due to USA policy that favors and shields Israel like no other state in the world. The leaders of the international community led by US policies and pressure have turned a blind eye to more than 6 million people whose basic human rights have been denied for over six decades. Israel’s illegal settlement expansion and land confiscation continues unabated because of US vetoes in the UN and an ‘occupied’ Congress. In 2011, Congress remained mute when Israel outlawed commemorations of Nakba and began punishing their citizens who support Boycott, Divestment from and Sanctions on Israel until Israel ends the occupation of the indigenous people. The Jewish people have a long history of oppression and the tenants of Judaism are rooted in social justice issues. America was founded by agitators, rebels and dissidents who essentially told the King of England to back off this land. When the Governments of America and Israel bridge the gulfs that separates their actions from democratic ideals; and when politicians uphold equal human rights for all people; a just peace- which is the only way to security could reign in the region-but that requires enormous political and good will. Decades of creative nonviolent resistance to the evil of injustices inflicted by government policies and ideologies of superiority have led to this 30th of March.